What was medieval music? The truth is that little has been passed down in a tangible form such as written music because in medieval times manuscript paper was beyond the affordability of anyone outside of church and 'state' organisations. Hence what we have in written form is music that was created to support church activities such as the celebration of mass. This was not music played upon instruments but generated by the human voice - ie. chanting. Most people today have heard of the Gregorian chant and this is possibly the most well known vestige of truly medieval music still around. Today there is a wealth of modern music which uses medieval themes and connections as its basis. 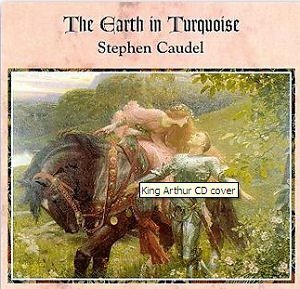 A good example is that of 'The Earth in Turquoise' - an album of instrumental music based on the legend of King Arthur. A modern 'programmatical' piece, it portrays the legend with each track depicting an 'episode' of Arthur's life. You can download mp3 samples from this epic piece and also read a detailed, music critic's review. You might argue and say that Arthur's legend was not set in medieval times which is technically correct of course but it was in the 12th century in medieval England that his legend truly became established and entered the annals of British folklore. It was in the 1100's that both Geoffrey of Monmouth and William of Malmesbury wrote about Arthur - Monmouth did so in his Historia Regum Britanniae and Malmesbury in Gesta Regum Anglorum. It is Geoffrey of Monmouth's work that has been the cornerstone of many historians' research into the origins of the legend of King Arthur. Part of the Arthurian legend of course is Tintagel in Cornwall, England where Arthur was born son of Uther Pendragon. It is believed that Tintagel Castle (constructed 1236) was built by the then Earl of Cornwall specifically because he wanted to associate himself with Arthur's legend. The surrounding area is deemed by many to hold no strategic value and the location is indeed difficult in which to construct such a fortress. In other words, there appears to be no real reason why Cornwall built his castle there. Testimony to the power of the Arthurian legend in 13th century Britain. Arthur's legend lives on and will surely inspire composers, artists and writers for many generations to come and it is probably the medieval writings of Monmouth and Malmesbury that we have to thank for that continued source of inspiration.